Living Art Aquatics specializes in bringing tranquility and a stunning variety of underwater life into your surroundings through aquarium design. 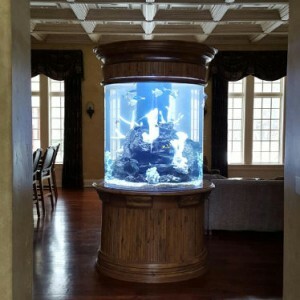 Our professionals with decades of aquarium service experience work closely with you to create a custom design in the comfort and convenience of your home or office. Living Art Aquatics is dedicated to the conservation of aquatic life and to the enjoyment of the hobby by providing professional aquarium services to “Create Living Art”. We take great pride in providing our clients with only the healthiest of livestock. All common & exotic livestock go through a strict quarantine process before being transferred into a client's aquarium. Our goal is to not only create a beautiful seascape through aquarium design, but to maintain the health and well-being of our underwater creatures. If you are looking for custom cabinetry or custom aquariums in Chicago, call us today! Our professionals have worked closely with homeowners, businesses, custom builders, & home improvement companies over the years & provide you with professional aquarium advice. Accidents happen, but you shouldn't suffer. We are 100% Insured & Bonded and provide professional customer service to all our clients and customers. We have provided our aquarium services all throughout the Midwest and Chicagoland for over 10 years to customers & businesses alike.